Netanyahu says Israel hoping to prevent break major conflict - but adds IDF prepared to use all of its might if war becomes inevitable. 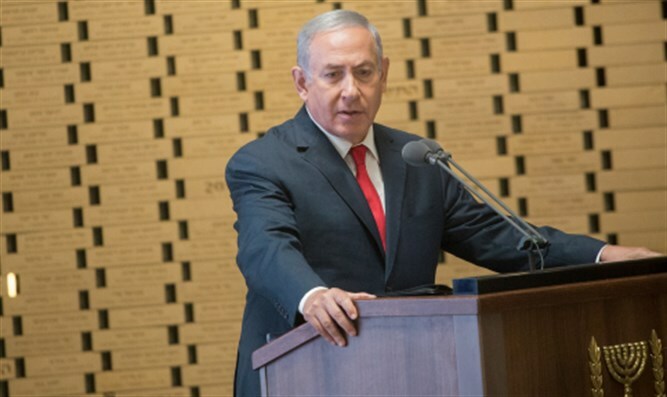 Israeli Prime Minister Binyamin Netanyahu addressed a ceremony marking the 75th anniversary of the Yom Kippur War Wednesday, saying that Israel would continue to work towards preventing the outbreak of another major conflict in the region, while adding that the IDF would not hesitate to use its “full force” if war does break out. During the ceremony at Jerusalem’s Mount Herzl military cemetery, Netanyahu emphasized Israel’s commitment to preserving peace. Earlier this week, Israeli fighter jets bombed a weapons development center in northern Syria, reportedly maintained by the Assad regime, with Iranian assistance. Despite the airstrike, Hezbollah chief Hassan Nasrallah claimed that the terror group already possessed “precision missiles”, warning Israel to “watch out”.